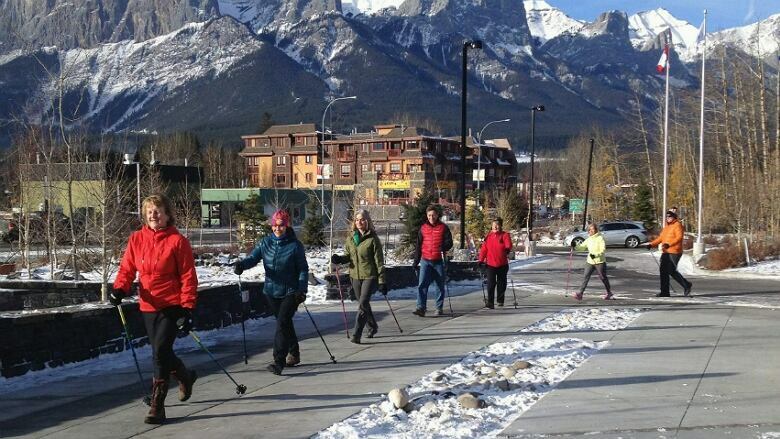 Urban poling is gaining popularity in Alberta and is great exercise for people of all fitness levels. A group of walkers hits the trail in Canmore. It’s cold, so they have their boots, toques, gloves and one more thing — a set of urban poles. They look just like ski poles, but these are specifically designed for walking. Mandy Johnson leads the walkers at a brisk pace, with a big smile on her face. She started urban pole walking after having a knee replacement at age 48. Now she is the Alberta ambassador for urban poling and rarely leaves home without her poles. “It is very new in Alberta," Johnson said. "Urban Poling is a Vancouver-based company that was formed in 2004 — 10 years ago — but it's really starting to pick up momentum in Alberta now because there are just so many benefits." Hikers have been using walking poles for a long time but the idea is to get people using them everywhere, including on walking paths in the city. Urban poling — also known as Nordic walking — is recommended for a wide-range of fitness levels. Everyone from high-performance athletes, to people who are sedentary and want to get active, to seniors who are worried about falling. "I call it four-wheel drive for humans," Johnson said. "It gives them stability and traction in the winter time." Johnson says when people use the proper technique — walking with straight arms while pushing down on the poles — 90 per cent of the body's muscles are engaged. It is a total core workout that burns more calories than traditional walking. Cochrane physical therapist Celia Gjosund says she recommends it for patients who are dealing with diseases like osteoporosis or are recovering from an injury. "These poles are excellent for people in rehab," Gjosund said. "You can run with them, you can hike with them, you can go up hills and down hills with them and they make you safe." Johnson says urban poling is gaining momentum in Alberta. She said there are about 60 instructors across the province and more are being trained. Now libraries are starting to rent out walking poles. So far they are available at libraries in Chestermere, Okotoks and Canmore. "It's a brand new initiative for us," Canmore Library Director Michelle Preston said. "We purchased 10 sets. They're available for local residents to borrow for three weeks at a time and it gives them a chance to try them out on all the walking trails here in Canmore." Johnson said people still "look at her funny" when she is walking down the street with her poles, but she wants people to get used to it. "People will still say, 'Hey, you forgot your skis!'" Johnson said. "We're going to change that. In Europe they look at you kind of funny if you walk around without poles. There's seven million people doing this worldwide."